Reminder: Important dates to remember are listed in the slide show below, including sports schedules. You can also access the CRMS events calendar by clicking on the "Calendar" tab above. 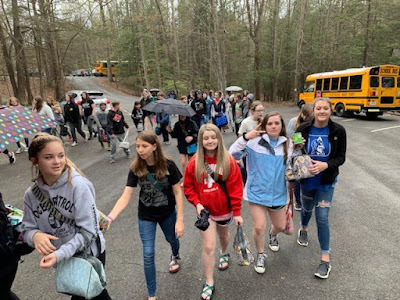 Click for 7th grade trip photos! Congratulations to the MHHS Lady Cougars on their 2019 2A State Championship! CRMS is so proud of you! As a convenience, you now have the ability to make secure online payments to your child's school. You can easily add money to your child's lunch account as well as other school payments. Select the icon below to access. Cane River Middle School is located about 3 miles west of Burnsville, NC, in beautiful Yancey County. Yancey County is the home of Mt. Mitchell, the highest peak east of the Mississippi River. Cane River opened its doors in 1958 as Cane River High School, one of two high schools in the county. In 1976, Yancey County consolidated the two high schools, Cane River and East Yancey, into Mountain Heritage High School. The two high schools were then turned into two middle schools. help all students achieve their full potential as life long learners and global citizens.